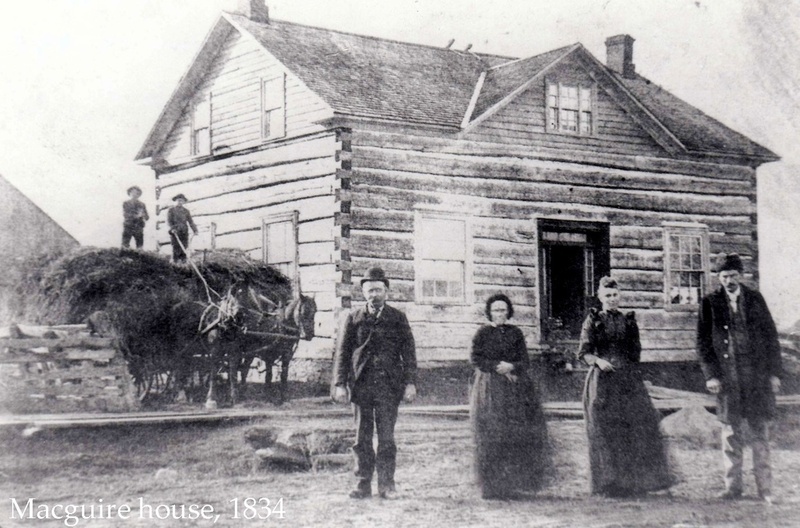 The farmhouse of Constantine Maguire built before 1840 is a prime example of the log farmhouses of the era and area. Like many area farmers, the Maguire’s updated their property, not by abandoning the log house, but by renovating it. This farm, with its crops and livestock as recorded in the 1861 census, provides valuable insight into the social and agricultural history of the time. It also demonstrates the diverse nature of the village with its mills along the river, stores and hotels on northern McBean St. and farms scattered throughout the village limits. This is the oldest house in Richmond said to have been built in 1828 (Carleton Saga) although registry books show that the land was not transferred from the Crown to the Maguire family until 1840. The obituary of Mrs. Constantine Maguire which appeared in the Carp Review on September 7, 1905 stated that she had lived in the house for 71 years which would put the date of construction in 1834. (Regardless as to whether the date is 1828, 1834, or 1840, there is no other house in the village which is known to be older.) It was here that Constantine and Frances raised their 14 children and on his death the ownership of the land was passed on to their sons. This was one of many working farms within the village limits. 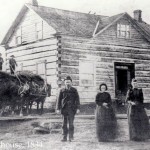 The 1861 census records show that this log house was only 1 storey ( the roof was raised at a later time), that Constantine’s 62 acres yielded 1100 bushels of grains and that he was the only farmer in Richmond to grow mangel wurtzel. In the previous year his 4 cows had produced the milk to make 60 pounds of butter and his sheep produced 20 pounds of wool. He had 3 barrels ( 200 pounds each) of pork and none of beef. Like many village farmers, Constantine was also a tradesman. He is listed as being a shoemaker. An Anglican, Constantine is shown as donating $16.00 towards the building of the new church in 1860. Although Constantine died in 1861, his wife Frances continued to live on the property with two of her children until 1905 when she died at age 93. She was survived by 12 of her 14 children as well as 90 grandchildren and 45 great-grandchildren. The property passed to Wm Todd and remained in his family until the 1940’s. The house was constructed of squared logs . It has a centre door, an equal number of windows on each side, and double chimneys. The upper storey of cut log was added later and bedrooms were contained within the slope. 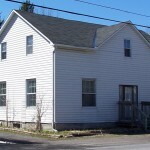 The house was updated by the addition of a secondary gable which contained a small plain square 8 over 8 paned window. Some features in the spirit of the classical revival style such as a simple transom and a pair of sidelights were added to the entrance. While many Upper Canadian families updated their homes by replacing the log house with a new stone, brick, or framed house in the popular Ontario cottage style, some families simply upgraded their homes by adding onto the existing log structure. 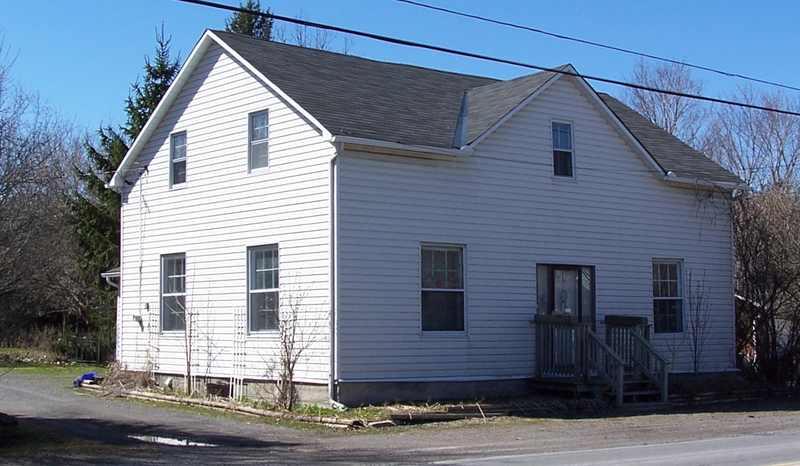 This is the case with the McGuire House where first the second 1/2 story was added and then a rear addition. Obituary of Mrs. Maguire. Carp Review September 7, 1905 reprinted in Graham, Mildred et al. Richmond “150” Yesterday and Today 1818-1968. Ottawa:1968. Goulbourn Township Historical Society files & walking tour. Kalman, Harold. A History of Canadian Architecture. Vol.1 Toronto: Oxford University Press, 1994. Menger, J. ” Social Life in the Village”, Richmond. South Carleton High School. nd. This entry was posted in Locations and tagged Farm, House. Bookmark the permalink.